Average Height	: 22" - 28"
The Standard Poodle has a long history – as far back as 400 years throughout Russia & Germany- depicted in 15th century paintings and in bas-reliefs from the 1st century. The "Poodle clip" was designed by hunters to help the dogs swim more efficiently. They would clip/shave off all the coat except around joints and organs, to protect these areas from the frigid cold waters from which they retrieved downed fowl. Poodles are exceptional retrievers, willing partners, focused and a soft mouth to return the birds unharmed to their Masters. The Germans & Russians discovered that Poodles made excellent hunters to uncover prized truffles lying underground in the woods. Poodles have webbed feet, developed for retrieving downed fowl from the frigid waters. The Poodle is known to have the largest brain per skull size of all dog breeds and is an Excellent Guard/Watchdog with their instincts to sense trouble and warn and react. They instinctively will stay close to any family member, especially toddlers, quietly staying aware and protecting them from danger. The myth that they are ‘barkers’ is untrue. Poodles warned their owners of strangers and become excessively excited when living with nervous, worried owners. Poodles talents extended to their ability to impress audiences as performers in circuses throughout Europe. All Poodles have been bred with the same temperaments and characteristics. Today all 3 sizes are officially recognized in all National Clubs. The Miniature and Toy Poodles were bred ‘down in size’ from their original cousins the Standard Poodle. They are considered one breed and are judged by the same written standard but with different size requirements. This versatile breed excels in numerous arenas, including hunting/retrieving, agility, flyball, watchdog, competitive obedience and impressing us as tricksters and entertainers. •	Healthy and known to live longer than 17+ years. The Standard Poodle is considered the smartest of all breeds. They have the largest brain per skull size of all dogs. They are intelligent, loyal, adaptable dog, has a happy, playful personality, and often described as having great sense of humor. They even serve as a great Service dog. This can be tricky for owners new to the breed because frequently owners find themselves laughing at their Poodles naughty antics and the dog will actually take that laughter as praise for the behavior. As an extremely intelligent and highly trainable dog, Poodles need to be mentally stimulated and taught positive behaviors or they will teach themselves, and owners may not like what they learn. Many Poodle owners talk about dogs who know how to upon the refrigerator or even unzip a purse and remove dog treats. However, since Poodles are eager learners new owners will not find this a difficult energy to channel. The non-shedding quality of the Poodle's coat means that it does require rather extensive grooming. It is best to brush your Poodle's coat every week to keep mats from forming, and after any outdoor adventures to remove any burs or twigs from the coat. These sessions can be very pleasant and a nice chance to bond with your dog and check him or her over for any cuts or abnormalities. Begin grooming your dog as soon as you adopt him or her in order to ensure that grooming does not become a feared or unpleasant experience. About every 4-6 weeks your dog will need to be taken to a groomer to have its coat cleaned and trimmed. New owners should be prepared to pay between $35 and $50 or more per grooming session. The price is determined by the size of the dog and the condition of the coat when it is brought in, as well as the area you live in. An ambitious owner could try to learn to groom their dog themselves, but it can be rather involved and hard to master. The style is entirely up to you. I had Standard Poodles, and clipped my Male like an Airedale Terrier. It looked great and we got many compliments. There is also a style called corded which creates a very unique look. It is rather like "dreadlocks" on people, but can be difficult to maintain. They should have a daily walk to burn off their excess energy and keep them calm and manageable in the house. A daily 30 minute to hour long walk daily should be enough, a session of fetch in the yard or park will also help. 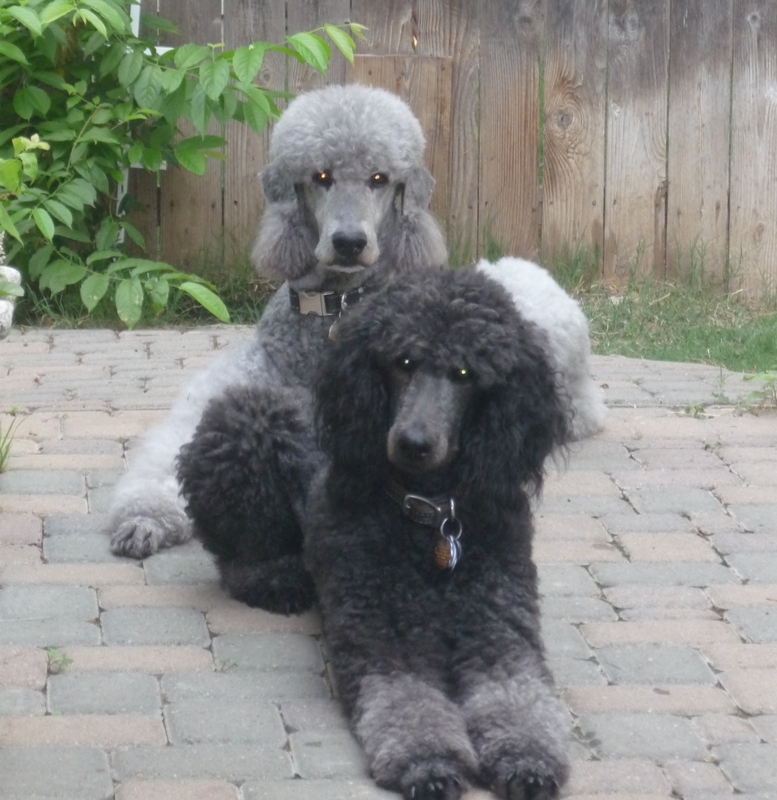 The Standard Poodle is highly intelligent and easy to train. As the saying goes in dog training, "you can't teach nothing," even if you are unaware of what you are teaching your dog it is certain he or she is learning something from you. Take this in hand right away and don't let your dog learn bad behaviors. By actively choosing what you teach your Poodle you will avoid circumstances where your dog learns destructive behaviors before you even realize it. There are too many rejected dogs cast into shelters and rescues for reasons that might have been avoided. You will find training to be easy and rewarding with a Poodle by your side. Talk to your local Kennel Club or Humane Society to find out what groups in your area offer dog training classes.